Although it could be argued that climate change has been a natural and frequently occurring phenomenon over the recordable history of planet Earth, scientists, politicians and individuals have largely agreed recently that the practice of releasing harmful 'greenhouse gases' into the atmosphere is contributing to global warming. These gases absorb the reflection of the sun from the Earth's surface, trapping heat within the atmosphere, and therefore causing 'global warming'. 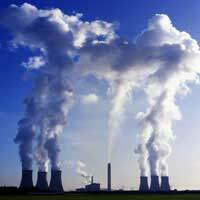 Whilst there are natural gases that have this effect such as (carbon dioxide, methane, nitrous oxide, and ozone), it is man made greenhouse gases that pose a threat to the environment, due to the huge increase in their production since the industrial revolution. Whilst man made gases, such as carbon dioxide, occur naturally, the increase in emissions of carbon dioxide (carbon emissions) due to human activity, could have a detrimental effect on the environment. The gases considered to be most dangerous, and those that could be reduced by changing the ways in which people source their energy are: Carbon Dioxide (C02), Methane (CH4) and Nitrous Oxide (N2O), that have increased (respectively) 31%, 150% and 16% since the mid 18th Century. Other gases that are considered harmful to the atmosphere include: Hydrofluorocarbons (HFCs), Perfluorocarbons (PFCs) and Sulphur hexafluoride (SF6). Carbon dioxide is produced by the burning of fossil fuels in the production of electricity, and during fuel consumption for land, sea and air transport. Carbon Dioxide is considered to be the main contributor to the build up of green house gases. Hydrofluorocarbons are found in fridges, aerosols and other perfumed and/or cosmetic products. Methane and Nitrous Oxide are produced as part of agricultural practice, in the burning of crops, the adding of nitrogen to crop soil to aid fertilization and in waste combustion. They are the second and their biggest contributor to the build up of green house gases. It is widely considered that carbon dioxide is the biggest single man made contributor to climate change. It is also the contributor that a concerned individual can have the most impact on, simply by cutting down on the use of petrol and diesel fuels and changing a few shopping habits. There are other causes to climate change which are entirely natural, including variations in the earth's orbit, which take place over tens of thousand of years and affect the distance of the earth from the sun and the release of natural greenhouse gases. Because global warming has a cumulative effect (i.e. a small increase in temperature will trigger a larger increase), an increased natural release in greenhouse gases, could in itself lead to a dramatic change in climatic conditions, relatively quickly. It is now well established that CO2 does not cause warming.It actually works the other way around: Warming produces more CO2.Nearly all the recent increase in this trace gas is due to a natural warming cycle..Both the historical pattern and geopulsation theory indicate we are reaching the peak of the present interglacial (warm) period (see Roots of Cataclysm, Algora Publ. NY 2009). This will be followed, as has always been the case, by another glacial episode.Long term, prepare for a massive migration of Canadians into Dixie.